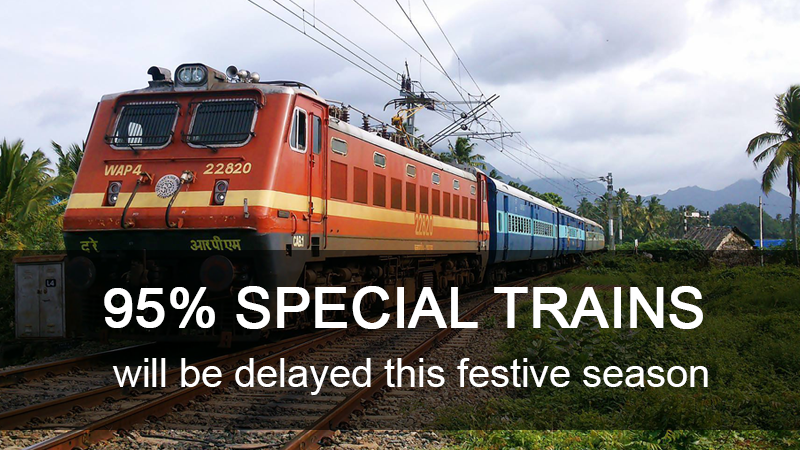 RailYatri confirms that more than half of the special trains run with heavy delays. Well and good if you have a regular trains’ confirmed ticket, but if you don’t, it doesn’t matter if a special train gets delayed or not, you are bound to board the same as a last minute option. However, it is advisable to plan well in advance to avoid getting delayed. RailYatri studied the trend and found some viable causes resulting in the delay. 1. Forced inclusions: Special trains are included in the schedule as a last minute decision to overcome the rush. This makes it difficult for the authorities to run these trains with proper planning. The station masters, on their part, find it hard to accommodate these excess trains in the schedule they follow every day. 2. Second preference: Since it’s hard to accommodate the additional trains, when there is a regular train and a special one waiting at a signal, inevitably the regular train will get a first preference to pass through. The special trains have to wait for their turn to move ahead, causing a significant delay in their run times. 3. Over utilization of the coaches -Every zone is always under pressure to send a special train to as many places as possible; however they also have a finite number of train coaches (which finally makes a complete train) available with them. In the zeal to maximize the number of places where the special train can be sent – the running schedules of these coaches are typically jam-packed. Delay in the run of the train to one city can result in unrecoverable delays in trains to other cities. 4. Shortage of staff: Since the special trains are being announced on short notice, there is always lack of resources to manage the extra inflow of additional trains. For example; railways need more guards, TT, and other staffs to run the extra coaches. So, shortage of the staffs contributes a significant reason in delays of these trains. 5. Goodwill doesn’t matter: Regular trains run all through the year, so their performance ratings do matter to the railway authorities. While it is opposite for the special trains as these are time limited only and complaints against them do not much matter for the overall. Per RailYatri’s database some of the maximum average delayed special trains include; Varanasi – Bhatinda Tatkal Special, Madgaon – Mumbai Exp SPL, Gorakhpur – Guwahati Exp Spl, Old Delhi – Chhapra Jansadharan Spl and Haridwar – Malda Town Exp Spl. These trains have been recorded with an average delay of 15-16 hours. Now that you are aware of the fact, you definitely will not want to take a risk of traveling on special trains. RailYatri would advise you to make prior travel plans for the festive season and try to negate the special trains as far as possible. If you are amongst last minute planner, you may want to check the timeliness of the special train to avoid any kind of inconvenience. A good trick would be to check the arrival time of the train at the source station. If the train arrives late, it is definitely going to get delayed double the time. You may keep checking the live train status and live train announcements in the RailYatri App to plan your trip. Yes, the causes given for the special trains are quite understandable. My question is why the regular trains run late? When you claim that the regular trains are given priority over the specials, why then the regular trains that run daily are regularly running late even these days when the festive season is yet to start? For example take the of Purushottam Exp, that the runs between NDLS and PURI on daily basis and had been running late on a regular basis on both the directions. Kindly give me the reasons for such late running of trains and also the steps that can be taken to avoid improve. Weekly regular trains also face the same problem of beinng held up at signals resulting in delay. Trains between Kanpur & Mughalsarai are delayef maximum. Please I want ticket train from Bhadohi to kalyan..
Join extra coach with regular train to decrease the load add extra engine if required to pull the coach. Stop long root trains at big cities so that waiting list will be short and save journey traveled time. Now a days . Railways are taking additional fare for special trains. It seems railways thinks additional rates are taken for additional time to be in train. Since Railways have no timings for special train , person traveling in special train can enjoy with additional extra hours to be inside the train. This is how Railway is working. This is the improvement we need in every department. A man Having some problem then he should sit there for hours. Please see that we should not forget the value of time and money. If a train is late by more than 3 hours:-full money should be refunded. Why all special fare trains get delayed…????? Since fare of such trains are much more irrespective of other trains. U r charging more but provides less. Let us first clarify: RailYatri is an independent organization not related in any way to Indian railways. We merely provide travel booking services for ease of the passengers. Now, coming to your question: there are a number of reasons for the delay of special trains. First of all, Indian railways always gives preference to their regular trains, at any signal, to special trains. Secondly, the special trains are meant for last minute travel planners so Indian railways thinks of these as a special facility to reach you to the end destination. There are a number of other viable reasons about which you can learn in one of our prior blogs: http://blog.railyatri.in/top-5-reasons-why-your-special-trains-will-get-delayed/.